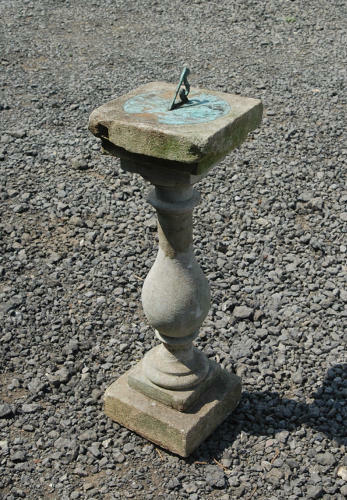 A beautiful and timeless, antique garden sundial with original dial. The base has a lovely shape and stepped plinth and is made from sandstone or similar. The dial is heavily patinated, with a blue face and traditional roman numerals. The time piece has a scrolling design. The words "Tyme Flyes" are inscribed across the face. The sundial has a wonderful, weathered, appearance, with patina and wear. The item is antique and therefore has some signs of wear and use, adding to the character of the piece. There is a substantial break to the stone body, which has been repaired some time ago, using more modern materials. The main crack is still visible but the sundial is useable and sturdy. There is some weathering and this has worn the stone corners of the dial. There is patina, marks and staining. The wear and weathering gives charming appeal and the sundial would be a very attractive addition to a garden or outside area.